For many businesses in America, the internet is wireless. Their workforce accesses the internet through laptops, smartphones, and their Wi-Fi connection. To support this dynamic, businesses depend upon their wireless network infrastructures. In the world of Cisco, customers have two options when constructing their WLAN. They could either deploy an on-premise Cisco solution or go for the cloud-hosted Meraki route. Each has its own benefits and drawbacks, and before making a decision, you should understand how these solutions stack up against each other. The real difference between these two solutions has far less to do with features, capabilities, or use cases—though they are a factor. The truth is that both of these solutions will be a viable option in the vast majority of instances for the vast majority of companies. One of the most important distinctions between Meraki and a Cisco on-premise solution is that one is largely an operational expense (OpEx) while the other is a capital expenditure (CapEx). Meraki requires customers to purchase an annual license in order to use their solution, but the upfront deployment costs are noticeably lower than an on-premise Cisco solution. By contrast, the Cisco on-prem solution requires the customer to purchase and deploy more hardware in order to support and manage the WLAN. Therefore, the upfront cost is going to be greater, but you avoid the ongoing annual costs of renewing licenses. However, that comes with its own collection of hidden costs. Without the assistance of the cloud-hosted Meraki platform, the customer is on the hook to maintain the solution. That requires an investment in skilled personnel who must spend a portion of their time supporting the WLAN. It should be restated that both Meraki and Cisco on-premise are viable routes for many deployments. To call Meraki inflexible or rigid would be a disservice to the solution, but the Cisco on-prem is the more flexible option of the two. The hardware is yours. All the equipment is yours and is supported by your team. That provides greater control of your WLAN than using a cloud-hosted platform provided by Meraki. If your business requires different antenna types for coverage, if you have the engineering talent in house to support it, the added flexibility of an on-premise solution might appeal to you. Cloud-hosted: The Meraki Cloud Controller interface can be managed from any location with Internet access, as the controller is in the cloud. Meraki has a mobile app that is iOS or Android compatible so that the environment can be managed from truly anywhere and any device. The Cisco Premise-Based Controller must be managed from the same location or via the Internet via a VPN client. Intuitive Interface: The Meraki cloud interface is more intuitive, easier to configure, and has more enhanced feature functionality than the Cisco WLAN Controller interface. With the Meraki cloud solution, administrators can add wireless access to new locations with fully automatic provisioning, utilize application visibility and control (AVC) to identify which critical apps are being used with the ability to prioritize those critical applications, throttle the bandwidth for specific applications or block specific applications altogether with a few clicks and easily identify BYOD clients and subsequently automatically apply access policies against those devices on a device level or a device group level. The Cisco WLAN Controller interface is not nearly as intuitive and requires an engineer with some deployment experience to get the job done correctly. Additionally, the Cisco WLAN Controller doesn’t offer the same level of access control/application usage policies, traffic shaping capabilities and location analytics. Single Pane of Glass: With Meraki, the entire network can be managed under a single pane of glass as it has the capabilities to unify WAN, LAN, WLAN, and mobile device management under one page. The Cisco on-premise solution requires multiple points of management and additional layers of software to get the same level of visibility. Always updated: With the Cisco solution, it is best practice to upgrade the code on the WLAN controllers once or twice a year which can be complex and definitely production impacting. With the Meraki cloud solution, IT departments can forget about upgrades or having to patch anything. The new Meraki features and code levels are delivered as automatic updates so that you are always up to date for new device types/application profiles as well as any new tools for the management dashboard. Cisco Infrastructure Compatible: An on-premise Cisco WLAN solution will be compatible with any existing Cisco Aps deployed in your environment. If your business has already made a WLAN investment in the past, this could reduce the overall cost of the deployment significantly. In-house Technical Skills: One of the core values of Meraki is that you don’t need an in-house team to support the solution. If you are already paying a skilled and experienced in-house team, it may make more financial sense to leverage that investment instead of relying on the convenience of the Meraki cloud-hosted solution. Cisco Access Points: Cisco provides a larger selection of available access points. This allows you to select the perfect device for your particular deployment. If you are considering your WLAN options and would like recommendations based on your unique business environment, please contact Mindsight for a consultation. Networking principles are changing, and on the forefront of network administration technology is software defined networking. By abstracting the administration from the equipment, IT administrators can gain greater control and create greater efficiency. 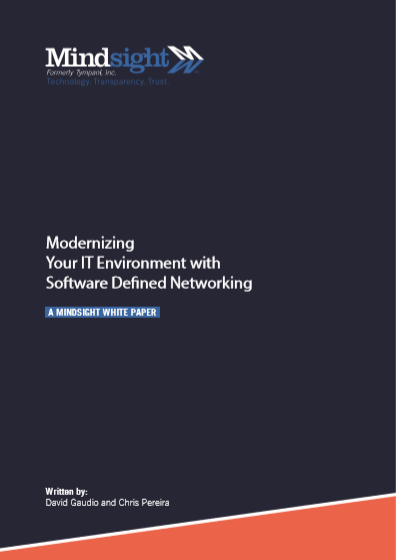 Download our free white paper to learn more about software defined networking.